"i knew the stoliby family. great family ! sorry for the..."
"Ruby was a cheer leader at Woodland Hi along with me. 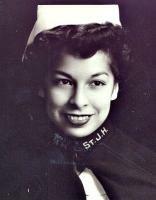 It..."
"I knew Ruby in Nursing School in the early 50's. She was..."
"Don, You added much happiness to Ruby's live over the past..."
"Enjoyed Ruby so much'She was a classmate in nursing school." Memorial will be held 12:30 p.m., Saturday, June 6, 2015 at Evergreen Memorial Gardens, Vancouver, WA.